Hayabusa is the leader in combat sports gear. Hayabusa delivers an unmatched level of innovation and quality. Hayabusa has become the new Gold Standard for combat equipment and technical apparel. Hayabusa fight has all types of performance equipment. Gloves, shin guards, head gear, footgrips, protective cups, and hand wraps. Hayabusa also sells training pads, heavy bags, jiu-jitsu gi’s and belts. We use lots of Hayabusa gear ourselves and the gear has held up over years of use. We are big fans of their Muay Thai equipment, especially their shin guards. Use Hayabusa Fightwear Discount Code MAYNUTS and save 20% off. Hayabusa has partnered with Glory Kickboxing. Hayabusa is the supplier of Boxing gloves for all Glory Kickboxing fights. 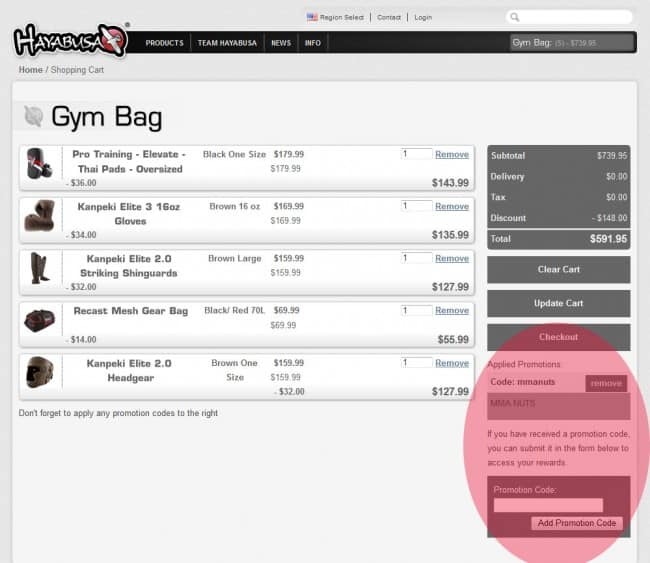 When you checkout, there’s a box on the lower right hand side where you can enter our Hayabusa Coupon Code MAYNUTS and save 20% off.